Philosophers have been pondering the following question since antiquity: What is knowledge? It seems as if a definite answer is yet to be found. This deadlock of opinions on knowledge might be exemplified by Aristotle’s and Descartes’s understanding of it. Aristotle (384-322 BC) as the founder of empiricism argued that all knowledge is based on experience and, as such (on account of the fallibility of the senses), only probable . Descartes believed, conversely, that (certain) knowledge can be obtained from innate ideas through inference . Albert Einstein said that knowledge is experience, having in mind philosophical knowledge. Karl Popper defined knowledge, within scientific framework, as a set of empirically or logically reasoned arguments, which can be subjected to criticism and falsification. Classically, knowledge is considered in connection with data and information, from which it is formed, and wisdom that arises from the accumulation of knowledge on a given subject. 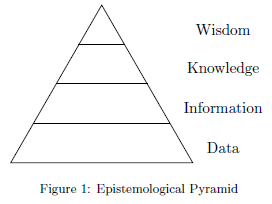 Such approach can be represented graphically in the form of the epistemological pyramid, as shown in Figure 1. Davenport & Prusak see knowledge as a developing combination of experience, values, contextual information and expert insight that provides a framework for assessing and assimilating new experiences and information. In their work, they also state that knowledge, in order for it to have any value, must contain human context, culture, experience and interpretation . Knowledge can be viewed within knowledge continuum consisting of many dimensions. In  and  the authors describe two types of knowledge: tacit and explicit. Tacit knowledge is known only to its holder as intuition and cannot be directly expressed by data or knowledge representation methods. Explicit knowledge, on the other hand, is structured and can be expressed directly by knowledge representation structures. Nowadays it is believed that knowledge does not exist in pure states (as absolutely tacit or perfectly explicit knowledge) but is a mixture of the two. Consequently, knowledge is specified within continuous knowledge dimension, boundaries of which represent purely explicit and absolutely tacit knowledge. Alavi & Leidner distinguish individual and social knowledge as two categories, which can be viewed as ends of an additional dimension . Yet another dimension of knowledge continuum can be constructed with procedural and descriptive knowledge on its edges. 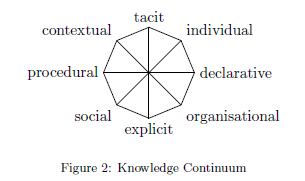 Multidimensional knowledge continuum can be presented visually as shown in Figure 2 (4 dimensions reduced to fit into 2 dimensions on paper). Further dimensions can be created and they may contribute to more accurate depiction of knowledge. Representation stands for a relation between two spheres, one of which is designed to replace the other. The former is usually better defined, more direct or easier to access than the latter. Knowledge representation is a field dealing with using formally defined symbols to represent a set of facts or conclusions which constitutes the knowledge of a given individual. 1. which knowledge to represent? 2. how to represent it, so that computer systems can operate on it? 3. Possibility of inference – possibility of conducting induction and deduction based upon the accumulated knowledge. 2. Soft approach – in this approach only inputs and outputs have formal relations with modelled entities. Is it often impossible to establish relations between symbols and represented elements. Decisions are based on statistics and not on well-defined relations. 3. Computer representation, which allows operations similar to those conducted on databases and methods of inference common in artificial intelligence. Many semantic networks are implemented using Lisp or Prolog. 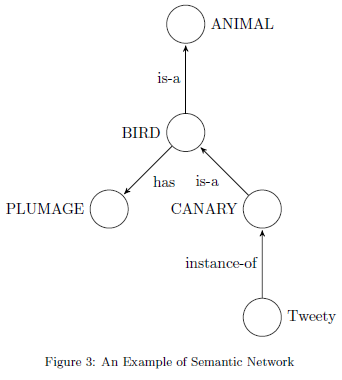 Despite these common features, semantic networks are heterogeneous, using different approaches to solve many issues, such as inference techniques or approach to inheritance. As mentioned above, semantic networks represent knowledge as a graph. Moreover, this graph is usually directed (digraph). An example of such graph or semantic network is presented in Figure 3. Modern semantic networks were introduced in the 1970s and became the most popular tool in artificial intelligence at the time, later fighting for the primacy with expert systems. Semantic networks are being used in almost every application of artificial intelligence, although they are losing popularity over the last 20 years. 6. Hybrid networks – combine at least two of the above. Knowledge representation and knowledge management are becoming noticeably important for present day companies. Not only is the volume of data that companies store and acquire every day higher than it was ever before, but increasingly more chaotic and turbulent environment forces an inflation of knowledge management importance. Turbulent environment makes not only knowledge management, but also risk management increasingly important for businesses. As stated above, there are two approaches to knowledge representation: symbolic and soft. An obvious difference between the two rises from risk management perspective. Methods within soft approach are effectively black boxes, properties of which can be explored only by using statistics. Symbolic approach has a valuable asset in this field, because methods within it can be studied carefully and their characteristics can be explained in a deterministic manner. This, in turn, is great when companies want to be certain that the negative scenario is not just improbable but impossible. Nonetheless, the soft approach has gained a lot of popularity over the last 15 years and is now bestriding the knowledge representation. Semantic networks are rarely used in business solutions and there is a exiguousness of research in the field. Neural networks, on the other hand, are used frequently in almost every business solution. Why is it that the approach which yields better understanding and better control of company processes fell into desuetude? The answer lies perhaps in the myopic economy. It seems plausible that the dearth of research in semantic networks and other methods constituting symbolic approach to knowledge representation is, perhaps paradoxically, an effect of increased demand for knowledge management in business. Companies need methods for working on knowledge right now and methods such as semantic networks are not yet fully developed. Normally that would mean an increase in funds for research in semantic networks, but we are living in a myopic economy. Companies are shifting their focus towards short-term results for many years now. Therefore they are not willing to invest in better methods, which would take longer to fully develop. This might be the main cause for the popularity of neural networks, which required less research (money & time) to be operational. The shortsightedness of companies means that their approach to knowledge might be suboptimal and therefore generating, possibly Bunyanesque, opportunity costs compared to the potential effect of symbolic methods in the long term. The real question is: what are the overall costs for societies caused by the myopic economy? Alavi, M., Leidner, D.E., 1999. Knowledge management systems: issues, challenges, and benefits. Knowledge management systems: issues, challenges, and benefits 1. Davenport, T.H., Prusak, L., 1998. Working knowledge: how organizations manage what they know. Harvard Business School Press, Boston, Mass. Duncan, S.M., 2008. The Proof of the External World: Cartesian Theism and the Possibility of Knowledge. James Clarke & Co., Cambridge. Hartley, R.T., Barnden, J.A., 1997. Semantic networks: visualizations of knowledge. Trends in Cognitive Sciences 1, 169-175. Jagielski, J., 2005. Inzynieria wiedzy. Oficyna Wydawnicza Uniwersytetu Zielonogorskiego, Zielona Gora. Nonaka, I., Takeuchi, H., 1995. The Knowledge-Creating Company: How Japanese Companies Create the Dynamics of Innovation. Oxford University Press, Oxford. Polanyi, M., 1967. The Tacit Dimension. University of Chicago Press, Chicago. Sowa, J.F., 1987. 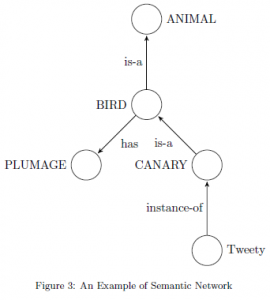 Semantic networks, in: Shapiro, S.C. (Ed. ), Encyclopedia of Artificial Intelligence. Wiley, New Jersey. White, F.C., 2001. Substantial knowledge: Aristotle’s metaphysics. Australasian Journal of Philosophy 79, 580-582.